This is a beautiful specimen of a very rare trilobite. It is a very unusual Megistaspidella triangularis from the Lower Ordovician of Russia. 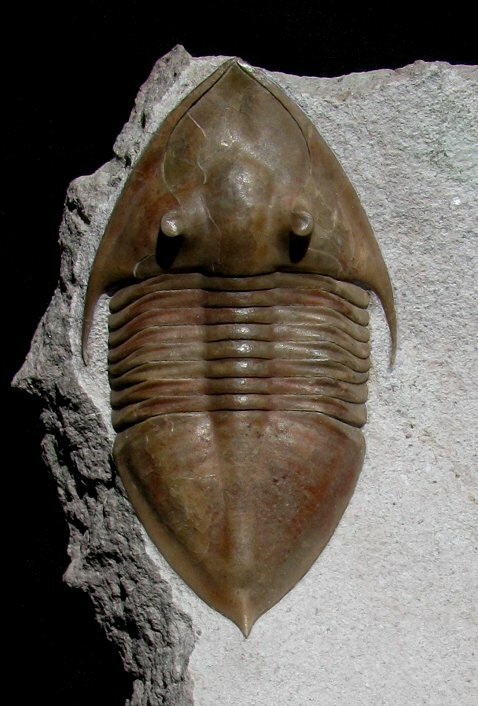 This type of trilobite has a very triangular cephalon with long, thin genal spines. The pygidium is also quite triangular and has a short caudal spine. All of these features are well defined on this specimen. This trilobite is 3-dimensionally preserved and wonderfully articulated. The fossil exhibits excellent detail - the protruding eyes are easily seen, and the sweeping genal spines also display well. The butterscotch-colored trilobite contrasts beautifully with the light-colored matrix. The trilobite is naturally showcased (not composited!) on the sculpted block of limestone. This is an extremely collectible example of this very distinct trilobite, Megistaspidella.